The thirty-second edition of the Comparative Law Yearbook of International Business comprises two volumes, each dealing broadly with issues relating to cross-border and mergers and acquisitions. 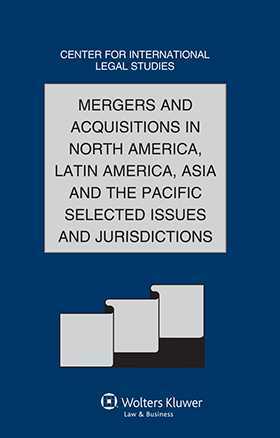 Volume A provides 16 chapters and examines mergers and acquisitions in Europe. Volume B provides 16 chapters and treats mergers and acquisitions in North America, Latin America, and Asia and the Pacific. Each consists of national reports and treatments of selected issues within the respective regions. Volume B, Mergers and Acquisitions in North America, Latin America, Asia and the Pacific, Selected Issues and Jurisdictions, reviews the Australian Takeovers Panel, joint ventures in China, and employment issues in New Zealand, as well as national reports on Brazil, Canada, Chile, China, Colombia, India, Indonesia, Israel, Japan, Nigeria, The Philippines, Sri Lanka, and Trinidad and Tobago. The Australian Takeovers Panel – An Experiment That Has “Worked” Bob Baxt, Felicity Day, and Emily Coghlan. Foreign Acquisitions and Joint Ventures in China Li Jiao and Bart Kasteleijn. Employment Issues In Crossborder Mergers and Acquisitions in New Zealand Jennifer Mills and Emma Warden. Brazil André de Godoy Fernandes. Chile Patricia Núñez F. and Manuel Hinojosa P.
India Nusrat Hassan and Aishwarya Natarajan. Indonesia Sigit Ardianto and Ferdinand Julaga. Israel Russell D. Mayer. Japan Taisuke Igaki and Yosuke Yamaguchi. Philippines Hector M. de Leon Jr.
Sri Lanka Shehara Varia and Ishani Bandaranayake. Trinidad and Tobago Timothy Hamel-Smith and Nadia Henriques.